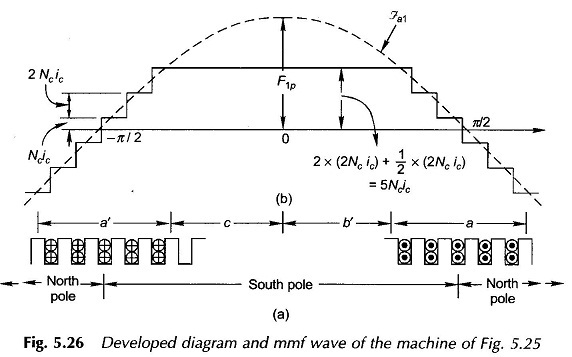 MMF of Distributed AC Windings – It has been seen earlier that the armature of a practical machine has distributed winding wound for the same number of poles as the field winding. As the armature carries current, the resultant field of its current-carrying coils has the same number of poles as the field winding. Our approach will be to fmd the mmf space distribution of the current-carrying armature by superimposing the mmf space waves of individual coils. and its sign depends upon the current direction. where 0 is the electrical angle measured from the magnetic axis of the coil which coincides with the positive peak of the fundamental wave. From now onwards only the fundamental nn if wave of a current-carrying coil will be considered, neglecting its associated harm•mic space waves whose amplitudes are small*. Furthermore, as will soon be seen, in a distributed winding, the rectangular mmf waves of individual phase group coils add up to produce a mmf wave closer to a sine wave, i.e. the harmonics tend to cancel out. It may be noted here that with the assumption of the narrow air-gap, the mmf distribution will be the same if the coils were located in the rotor slots instead. 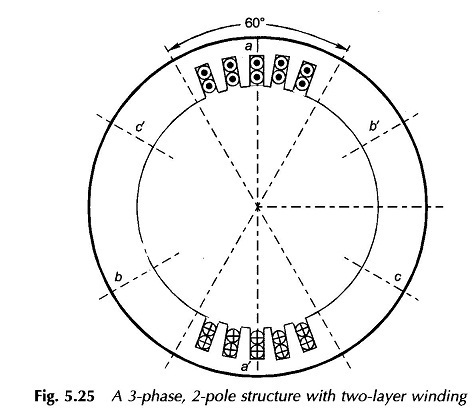 Consider now a basic 2-pole structure with a round rotor, with 5 slots/pole/phase (SPP) and a 2-layer winding as shown in Fig. 5.25. The corresponding developed diagram is shown in Fig. 5.26(a) along with the mmf diagram which now is a stepped wave—obviously closer to a sine wave than the rectangular mmf wave of a single coil (Fig. 5.24(b)). Here since SPP is odd (5), half the ampere-conductors of the middle slot of the phase group a and a contribute towards establishment of south pole and half towards north pole on the stator. 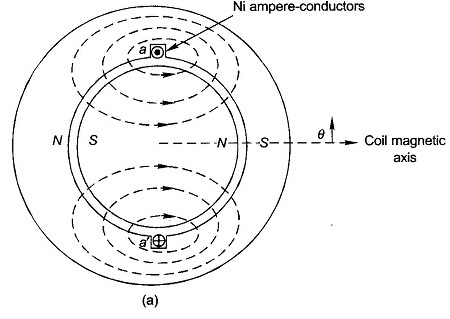 At each slot the mmf wave has a step jump of 2N ci, ampere-conductors where NN. 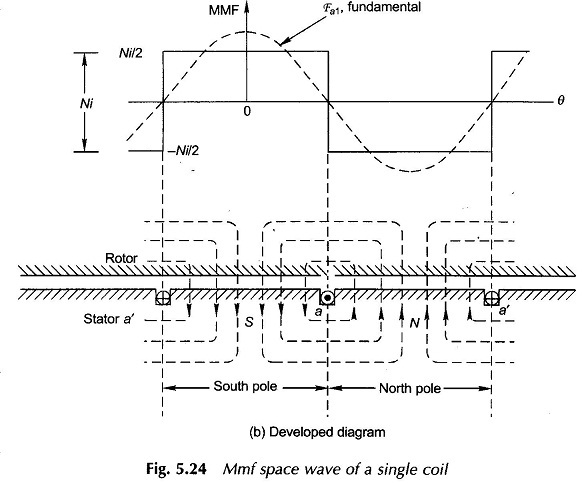 = coil turns (equal to conductors/layer) and is = conductor current. 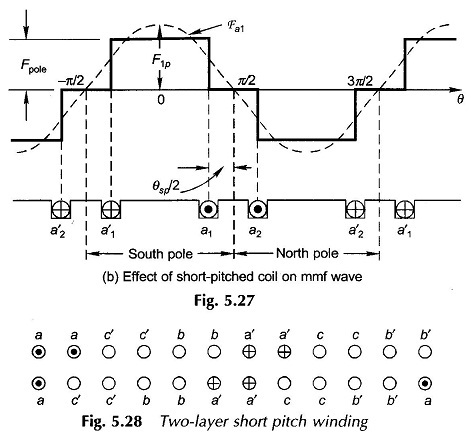 pole-pitch). These fundamentals are progressively out of phase (space phase as different from time phase) with each other by the slot angle y. This addition is easily accomplished by defining the breadth factor Kb, which will be the same as in the case of the generated emf of a coil group. where the pole axis is taken as the angle reference (Fig. 5.26(b)). It is not surprising that the same result is obtained for Kp for the space mmf wave as for the generated emf in a short-pitched coil. 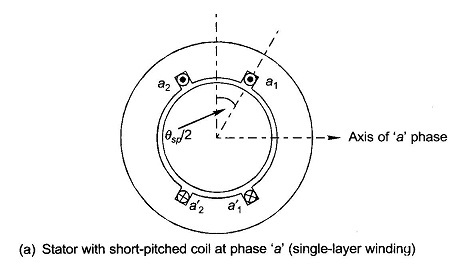 phase of the stator winding when carrying current is purely sinusoidal. Also Kb and K are defined in the same manner as for the induced emf. As per Eq. 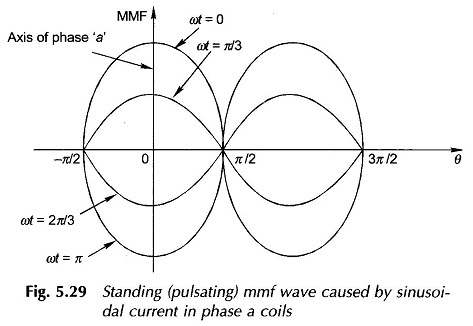 (5.36), the mmf of one phase is a standing wave (pulsating wave) in space whose peak always coincides with the phase axis while the peak amplitude varies sinusoidally with time. This is illustrated in Fig. 5.29, where a half-cycle of pulsation is indicated.